Hello. I am the woman behind the man behind the woman. That would make me Paul’s wife and Jillian’s mother, Kerry. After months of hearing from Paul and Jillian, Paul thought it was time for my side of the story. When he started writing the book, I teased Paul that the working title should be A Single Father’s Guide to Raising a Child with Down Syndrome. Paul is a wonderful father and has done an excellent job raising both of our children, but I was there too. At least give me credit for the birth! All kidding aside, raising any child is a team effort, but especially when raising a child with a disability. Whether your team is a spouse, extended family or the networking of professionals and other families in your situation, it truly takes a village. An Uncomplicated Life is a beautiful story of raising Jillian from a seedling into the awesome woman she is today. I have enjoyed the wonderful response to the book. So many people wrote to Paul and expressed their appreciation for such an honest and open account of raising our daughter. I’m grateful that you have found a connection in the words he wrote. I would like to use this space periodically, to tell the mother’s side of the story: How to stay informed of your educational rights (trust me, it will become necessary), or how even the most seemingly inconsequential situation can become a “teaching moment”. Or the more serious topics of teaching Jillian how to enjoy shopping (it involves food) and the importance of starting a conversation by asking about the other person’s day (especially when calling to ask for money). I stayed well versed on the law and thus well-armed for the IEP meetings. I researched the college opportunities for Jillian. I shopped for the prom dresses. I know some things, from the practical to the coping, that you might find helpful. I look forward to our discussions and exploring this wonderful world of parenting together. 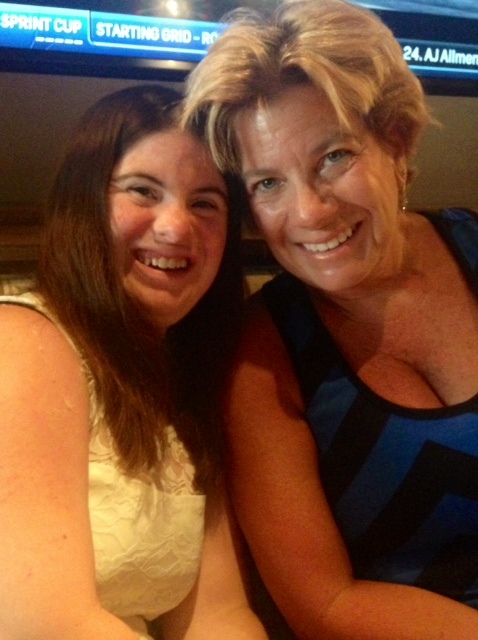 Every once in awhile, I will post a reader review of my memoir about my daughter Jillian, born with Down syndrome. We’ve had 52 critiques on Amazon.com. 48 are 5-stars. Here’s the latest, from just yesterday, from one of Jillian’s former bosses at Northern Kentucky University. It speaks accurately, I think, of her spirit. Thanks for reading Expect. Don’t accept. This might be the best book I have ever read! Having had the opportunity to get to know Jillian and become very good friends with her, I struggled reading this book without tearing up several times. I have known Jillian for about six years now and I was not aware of all the struggles that she faced growing up. The story about Jillian learning to ride her bike tells the story about the Jillian I know… She never gives up. She remains positive and is determined to get whatever task she has in front of her done. There is never a bad day with Jillian around. Even after losing a close game she has a way to cheer you up. When recruits would come on their visits, she was the first one to greet them at the door and tell them all about herself, the team, and the university. Having worked side by side with her at Northern Kentucky, a day did not pass that she did not amaze and impress me. I also had the opportunity to attend Jillian and Ryan’s wedding. This was the best wedding I’ve ever attended. 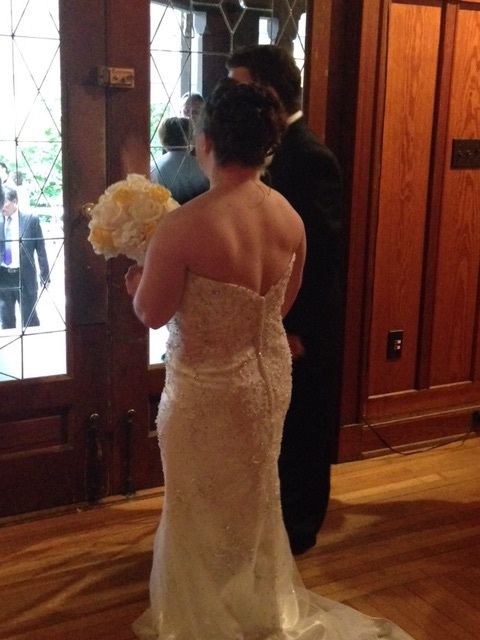 When Jillian walked down the aisle the entrie crowd had tears of happiness pouring out. Like the book says, everyone has helped Jillian get to the point in her life where she is at, but Jillian has also helped each and every person shes met get to the point in their lives where they are at! This is a must read! She always gets up earlier than she needs to. Jillian has to be at Northern Kentucky University by 9. That means taking the Metro bus to downtown Cincinnati at 7:05, and transferring to the Kentucky bus that drops her at work at about 8:45. 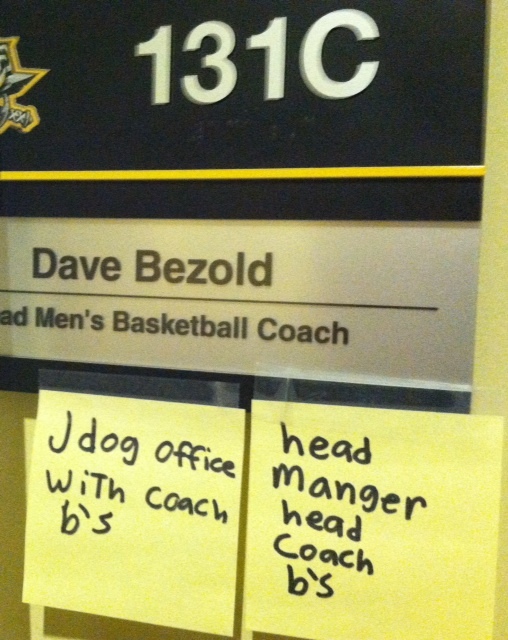 Five years ago, the former NKU men’s basketball coach Dave Bezold inaugurated the grandest of experiments. He’d seen Jillian around campus, where she was part of a trailblazing program that allowed students with disabilities to attend college. Dave also knew of Jillian through my writing in the newspaper. He asked her if she wanted a job managing the basketball team. Dave had a family history of helping people. His dad Frank made a lifelong habit of opening his home to folks in need of a break, be it a few days away from mom, dad or spouse, or a longer stay. Frank Bezold’s home was a haven for what he called “strays.” Dave recalls sleeping on the couch in the living room as much as in his own bed. Jillian wasnt a stray. But she was someone who could use a break. Dave was attracted to her spirit. Here was this young woman, maybe 4 feet, 10 inches tall, walking around campus as if she’d built it. As early as middle school, Jillian’s nickname was The Mayor, for the ease with which she interacted with peers and teachers. With help, Jillian learned to fit in as a manager She folded towels, mopped the floor, filled water bottles. During games, she did all that, while trying to maintain a professional objectivity when “her guys” were on the court. The relationship between my daughter and the team developed slowly at first. Players admitted they’d never spent a lot of time with a person born with Down syndrome, if any time at all. The interaction was slow and hesitant. She announced one day at practice she wanted to learn to do the Dougie. Her manager cohort, Danny Boehmker, gave here a few lessons, and she was off. Being a member of the JV dance team in high school didnt hurt. After about a week, Jillian auditioned for her team, after practice. The players hooted and hollered. Jillian continued to perfect her rapping, going so far as to design her own raps to involve specific team members. It became popular enough, Dave Bezold declared every Friday, post-practice, to be Jillian’s rhyme time. He gave her a time limit by setting the shot clock (35 seconds). The players gathered at center court, entirely obscuring Jillian — J-Dog to them — who stood in the center of them all, rapping. That was five years ago. Since, Jillian has completed 30 credit hours at NKU, received a certificate of graduation and inspired other parents to believe their kids can also go to college. The job continued after Jillian’s school days ended. It continues today, even though Dave Bezold lost his job after last season. 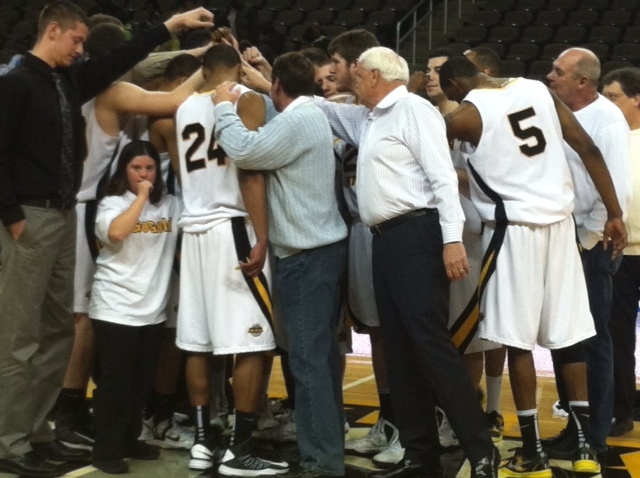 Jillian works 30 hours a week in the NKU athletic department, making above minimum wage. The four-bus, to-and-from takes more than 3 hours a day, and requires a change in downtown Cincinnati, something I wouldn’t be smart enough to negotiate. From NKU, Jillian gets a job and the acceptance, respect and responsibility that comes with it. From Jillian, NKU gets a loyal and dedicated employee, whose approach to life is infectious, instructive and memorable. Jillian gives as much as she gets, and vice versa. Isnt this how the human transaction is supposed to work? She got up at 5:30 Monday, just so happy to be headed back to work after a summer off. A little too early for the 7:05 bus she’s supposed to be riding. We might have to talk about that. Thanks for reading. Read more about Jillian’s job and life in my memoir about her, An Uncomplicated Life. All the world we could ever want rose and fell before us, atop the Upper Falls at Graveyard Fields. This part of the southern Blue Ridge heaves and rolls, like linen sheets on an unmade bed. Mountains are tributes to the beauty that patience can create. Kelly is 29 now. When he was 14, he and I made our first trek to these fine old hills. Back then, I referred to him in print (and occasionally in person) as The Kid Down the Hall. The label was supposed to be funny, but not lacking truth. Fourteen is not the kindest age for boys. It’s not the greatest time to be a parent, either. Mutual tolerance is the best everyone can expect. We saw him at dinner and occasionally on the weekend mornings he didn’t sleep until noon. Kelly lived in that middle distance familiar to adolescence, a world apart from his mom and me. I joked that I couldn’t always recall his name. Hence, The Kid Down the Hall. I’d made the trip to mountains by myself for several years by then. I liked it that way, a few days clambering around in the deep woods, just me and my head. Hiking solo can be cleansing, if you don’t mind your own company. Kerry my wife suggested I take Kelly with me. The last thing I wanted on that trip to contemplation was a moody companion to worry about. I was selfish enough, even the notion of it annoyed me. “No way,’’ I said. Kerry suggested it would be good for him and possibly for both of us. I won’t say she used the unfortunate term “bonding’’ – we aren’t wood glue cementing table joints – but that was the idea. Wonderful, I thought. Two people who didn’t especially like each other’s company, forced to spend 72 hours together. What a great idea. I agreed to it, reluctantly, because the part of me that wasn’t always mad at Kelly wanted very much to connect with him again, to rejoin his life. 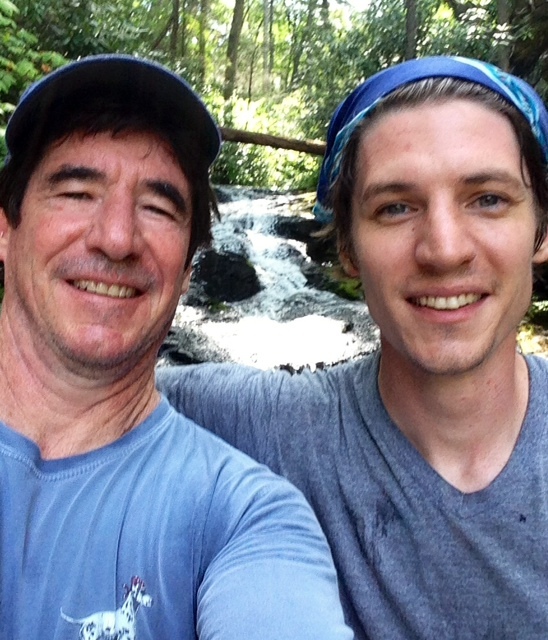 To be where we both were just a few years earlier, when I was Dad, a pretty smart, cool guy. The first year wasn’t great. One day it rained, so I ended up taking him to the mall in Asheville: A fate worse than death. Kelly had his earbuds and his GameBoy. He brought his silence with him. “Yeah. He raves about it to me,’’ Kerry said. You don’t say anything, I said, lamely. One, I was stunned that a 15-year-old could fashion such a poetic tribute to how I felt about those precious few days. Two, I was floored that it came from this particular 15-year-old. OK, I said. Same time next year. It got better after that. We’d mention the trip on the hardest of winter days. We’d plan the hikes. We fussed about the music in the car on the way down. We spent lots of time conquering trails and saying nothing. Meaningful silence, because the time down there spoke for itself. Every year got better. Gets better. Kelly snapped out of his kid funk (they all do) and has become a man in full. I like to think I helped with that, but I know most of it was just a matter of evolution. And, possibly, three days wandering the mountains every year. Another tribute to the beauty that patience can create. What does this have to do with Jillian, or with raising any child with a disability? A lot, because you don’t want your other kids to suffer from the time and energy you devote to your special needs child. Kerry and I were steadfast about this. We expected Jillian to do everything around the house that her older-by-three-years brother did. We accepted nothing less. If we did something special for one child, we found something special for the other. Kelly’s upbringing wouldn’t suffer for the extra time we spent with his sister. Partly as a result, they remain close, and Jillian has gained an independence similar to his. Meantime, Kelly and I still share the simple solace of tromping trails. (And these days, drinking local craft brews and listening to local roots music.) What a joy we found, 15 summers ago. What started as a way for a dad to try to connect with his sometimes wayward and unreachable son has become one of the highlights of my life. And I hope his. Sometime in January, when the days are pinched and hard and summer seems a rumor, I will close my eyes and see the perch we occupy atop the Upper Falls at Graveyard Fields. Sun on our backs, all the world we want. Feeling the need to do nothing. Connecting, the way the mountains connect to the sky. And I will smile a grateful smile. I received this e-mail last week. Reprinted, with permission. To parents of newborns: Life only gets better. To their familes and friends: You have a unique opportunity to see life in an improved way. The joy is palpable. First I would like to say Thank You. Three weeks ago my son Ethan was born. Prior to his birth, at around 20 weeks, my wife’s OB/GYN noticed some irregularities in his ultrasound. At the time, it was suggested my wife have an MRI and an amniocentesis. After the MRI, but before the scheduled amniocentesis, my wife met with a pediatric neurologist to review the MRI. The pediatric neurologist did not confirm what the OB/GYN had seen and suggested we continue to monitor his development, but that by all accounts our baby would develop normally. My wife decided to cancel the amniocentesis. It was not until our son was born and had to be taken to the NICU in middle of the night, that the doctors decided to test our son for Down Syndrome. During the three days between the testing and the results, I went through all the classic stages of grief, except for acceptance. Sitting in the consultation room and hearing the confirmation from the geneticist was almost impossible for me to bear. In those few minutes, I felt the loss of the son I thought I was supposed to have. All the typical hopes a father has for his son seemed like they would never be mine. I was in quite a state of shock, and was depressed and despondent. Unlike most parents facing this situation, I had years of experience working with the developmentally and physically disabled community. Prior to entering law school, I had worked for five years at a residence for men with severe physical and mental handicaps across a broad range of various disabilities. Additionally, I had spent a few summers working at a day camp for disabled children. I had a tremendous reserve of compassion and respect for everyone I took care of, no matter what the situation was. But it was knowing exactly what kind of lives many of them led, the burdens on their families and the communities, that caused me to fear for the future. I had thought that this would never happen to me. My state of unrest was short lived however. I had (have) a family to care for including a wife recovering from labor, and my two beautiful girls, ages 5 and 1. I knew I had to pull myself together immediately. As an attorney, I usually look to books to educate myself and overcome any deficit in knowledge or understanding. The first book that I came across was your book An Uncomplicated Life, about your daughter Jillian. I was moved to tears throughout much of the book, especially the poignant and revealing ending. I don’t know what the future holds for my son. I don’t know the extent of his delays or what kind of personality he will have, what interests he will have or if like my daughters, he will take after me. But after reading your story and seeing the overwhelming show of love and support that my friends and family have expressed, I feel that I can and will do all that I can to give my son as typical a life that he can have. There is still hope that I can teach him to love the Yankees, how to talk to treat women and to appreciate good music. I am sure you have received a lot of letters from parents like myself, but I felt I had to take the time to express my appreciation and sincerest thanks for putting into writing your story and giving me the inspiration to be the best father than I can be to Ethan and to all my kids. And finally, thank you for helping me experience the last stage, acceptance. I know I have only had my son for three weeks at this point, but there is a lot going on in my world and no time for setbacks. All you readers can’t be wrong! The book is many things – a tragedy that rights itself, an uncomfortable truth-telling, a documentation of celebrated milestones always preceded by many steps backwards, a chronology of souls evolving, a love story, actually many love stories, a collection of inspirational moments sure to shift your thinking, a thoughtful perspective on the gifts of a 47th chromosome, and a book for which I grieved upon finishing the last page. I wanted more. Paul Daugherty’s latest book, An Uncomplicated Life: A Fathers Memoir of His Exceptional Daughter, provides so many of those moments that define the joy of life itself. The story is not without moments of sadness, frustration, and even of anger, but the overall feelings that it left me with were joy, pride and hope! The story of Jillian is beautifully written. It had me hanging on every word, wishing there was more, and wondering what’s next for this family. It humbled me as a mom and allowed me the chance to step back, reflect on my life, my family, my children, my parenting and realize that this is such an uncomplicated life that we often times complicate on our own. Thank you for this story. It will stay with me forever! Just finished your book. Loved it! The next time I feel I am having a bad day, I will think of Jillian and her happiness. A book worth reading. Things we take for granted and the basic necessities we need to be grateful for. I couldn’t help but turn the page after each page. Beautifully written. “An Uncomplicated Life” should be read by every parent as it reaches out to the daily struggles of parents on so many levels. It will make you think of all the things you didn’t take the time to do with your child and wish you had. I am a moderately older, grizzled man but this book made my eyes sweat several times. A young woman I have never met has inspired me to live a more joy-filled life. I knew this book would be a good read. What I discovered instead was a GREAT read, with so much of his heart pouring out on every page. I’m a husband of almost 23 years and the father of 6 children and I learned or was reminded of so many things that I can be doing better as a father and husband every day. Thank you, everyone. Expect. Don’t accept.